Words by Kevin Doocey on September 30, 2012 . If you were to believe everything in the papers, Demba Ba would have left NUFC in January 2012, then again in the summer and now he’ll be set for his third departure in the New Year. As well as that, we’d have been left with Cheick Tioté, Papiss Cissé, Yohan Cabaye, Tim Krul and even Fabricio Coloccini. Sadly, it has come to a stage where it is no longer funny, or even maddening - quite frankly because papers (particularly tabloids) are so desperate for a headline, that they’ll regurgitate any old nonsense just to sell a few stacks. Simply by adding 2+2 , they’ve used the rumours of Demba Ba’s apparent unhappiness to link him with a move to Liverpool. Of course including the fact that Demba has a £7.5m release clause which is reactivated in January - they calculated everything and come up with 5. Ba, who scored another two goals yesterday to grab us a point against Reading is in fine form, and indeed leads the goalscoring charts. Not a bad start, considering Tevez, van Persie and Torres have all played the same amount of games as the man from Senegal. Liverpool also scored their fair share of goals in a 2-5 victory away at Chris Hughton’s Norwich - who are finding it tough to get any form going at the moment. With all that considered, Demba Ba has today been linked with a move to Anfield and some of the tabloids are pretty confident that a move will go through. Apparently, we are tired of talking with Ba’s notorious agents, and are willing to let the guy leave without much of a fight. Sounds very much like NUFC strategy to me, right? Personally, I cannot see why he’d want a move to Liverpool considering has become a cult hero at Newcastle United. 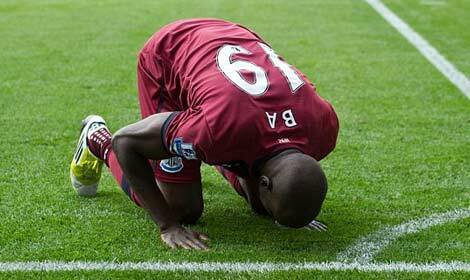 As well as that, is Ba the type of player Rodgers would look to sign? It’s much publicised that he needs a goal scorer besides Luis Suarez, but I honestly do not think Ba is the player he should be looking at. Bellamy would’ve suited his system just fine if hadn’t left. Comments welcome, what do you make of all the fuss? Newcastle and Liverpool. Two bald men fighting over a comb. We dont want him he's crap, you can keep your long ball dross, you'll need him when your back in the championship. you're not a scouser, I can smell a glory hunter a mile off. the circus will circulate rubbish as usual just to make a few quid. good player. but why would he want to leave. You haven't mentioned the £15m Newcastle would need to find to balance the deal . If Liverpool or any other team really wanted him he would of been away in the summer , as for the get out clause for 7.5 million ,how do the rags know it can still be activated ? well they dont . The only people that know whats in that clause is the player his agent and the men in charge at NUFC , maybe it could only be activated in the last transfer window and maybe only by a team in the CL . The fact is anyway the player himself has never once said he wants out .